Beautiful Monarch Butterfly Chrysalis Hanging On The Shingle Of Our Home On Cape Cod. 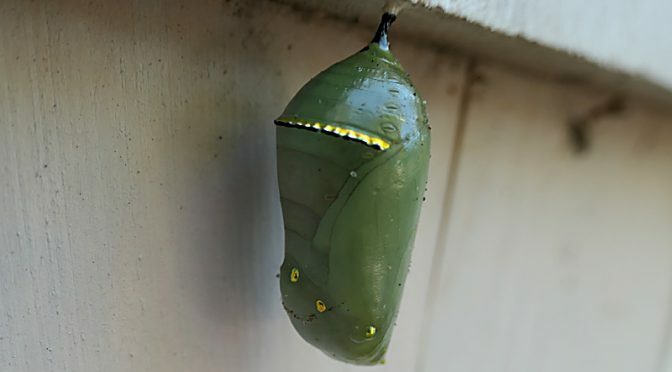 I was so surprised a couple of weeks ago to see this little green Monarch butterfly chrysalis hanging on one of the shingles of our home. It was breathtaking with it gold beads so evenly spaced. It’s only about an inch tall. 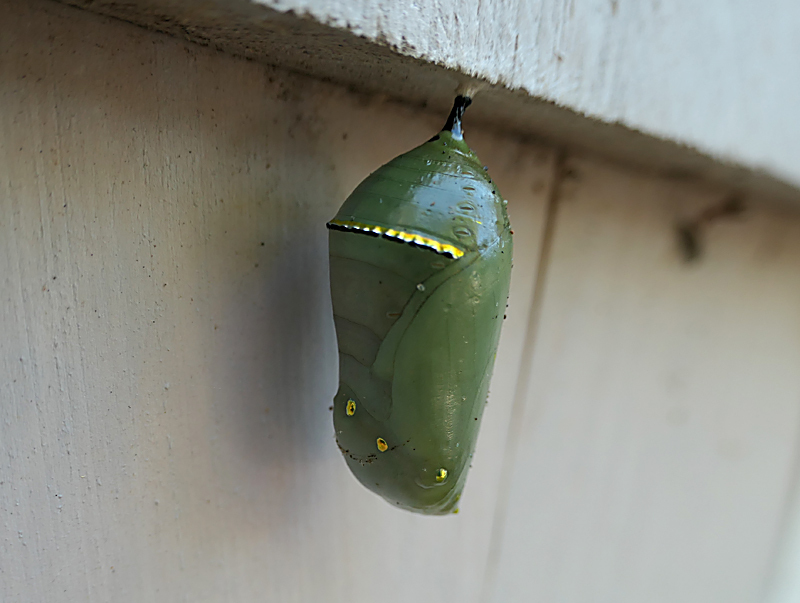 We have some butterfly flowers growing nearby, so a Monarch must have laid her eggs on it and the resulting caterpillar crawled over to our house and up about 2 feet where it made its chrysalis. I watched the metamorphosis of a Monarch on YOUTube. It is amazing! And to think that would happen in our yard was unbelievable! I highly recommend watching the video. But… it was so late in the season. Would it make it? I googled it a bit and made a few phone calls and was told that it could make it if the weather wasn’t too cold. Well, it’s been cold, but not freezing. My fingers were still crossed. 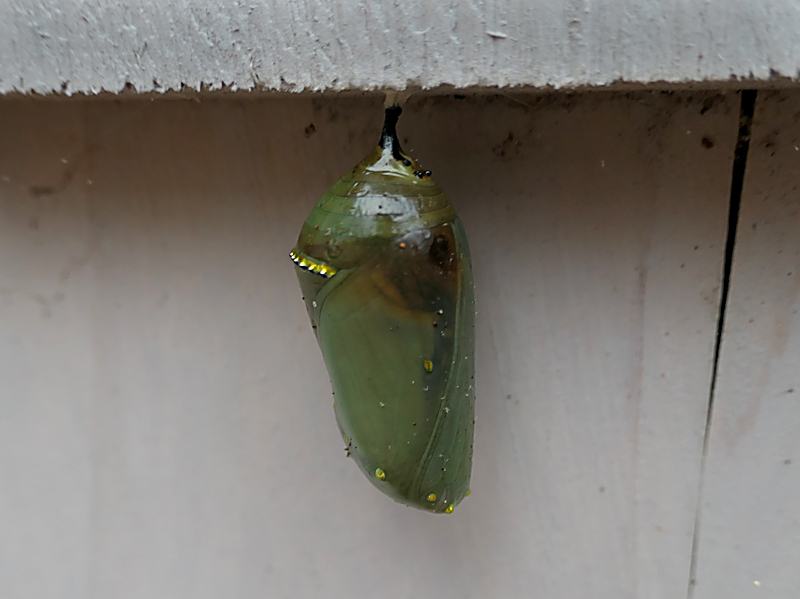 I went out daily to take photographs as the chrysalis will darken up a bit and then turn transparent so you can see the Monarch butterfly inside. And then its should emerge about 10-14 days later. Isn’t this chrysalis just spectacular? I had seen this little Checkerspot butterfly out of the corner of my eye for a few days at Fort Hill but was unable to photograph it. It never came close enough until… We were walking on the trail by the marsh when it alighted on a leaf by the side of the trail. We were able to take a few photographs of this pretty butterfly. 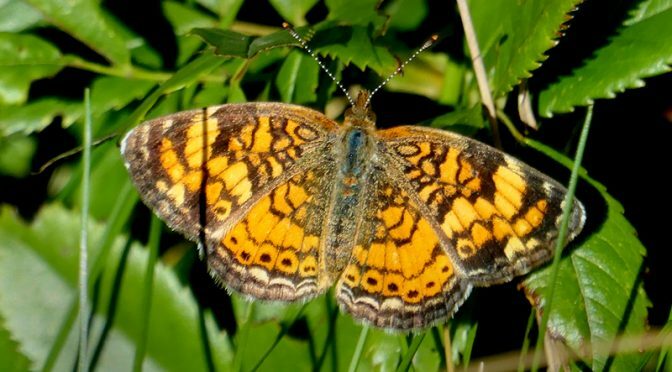 Have you ever seen a Checkerspot butterfly? Pretty little thing! The Milkweed Seeds Are Dispersing All Over Cape Cod! 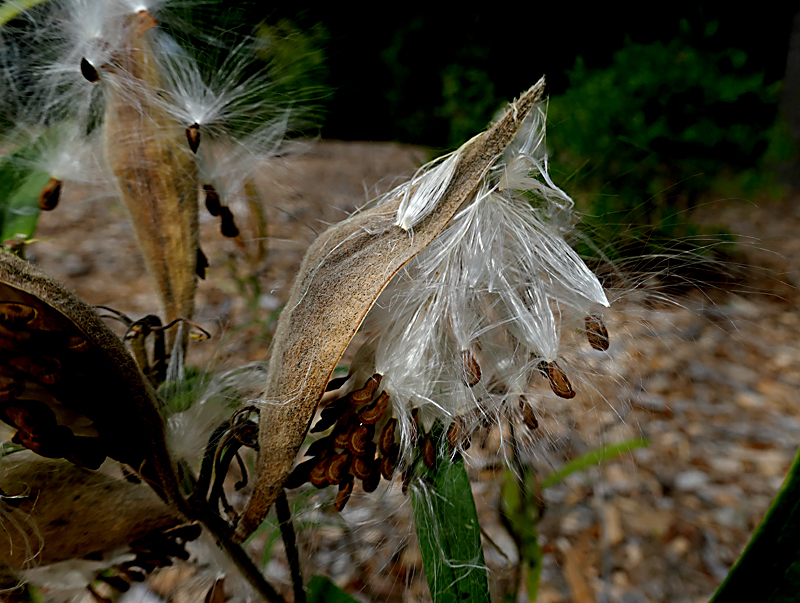 The Milkweed seed pods are opening up and the seeds are ready to disperse into the air. They are amazing to watch, and so pretty. 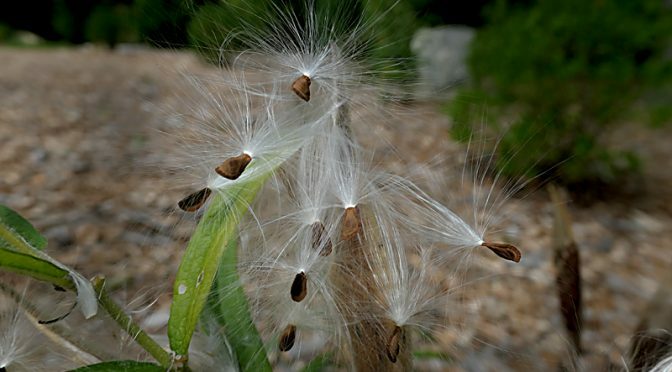 Milkweed is the primary food for Monarch butterflies, so we hope that the seeds land everywhere… maybe even in my yard? Pretty in the sunlight, don’t you think? This was the first Painted Lady butterfly that I’ve seen all summer here on Cape Cod. I usually see tons of them throughout the summer months. I thought it was so strange that I hadn’t seen any at all. This was the only Painted Lady that I saw at the Audubon and it looked so small. I don’t remember them being so small. I researched on the internet and it says that they are a large butterfly, as I had remembered. I wonder why it was so small and why I haven’t seen any all summer? Anyway, it was such a treat to see one at the very end of summer. They are such a colorful butterfly. 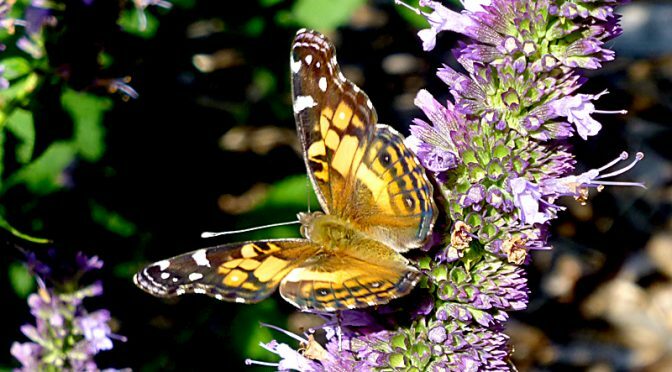 Have you seen any Painted Lady butterflies this summer? The Cabbage White butterflies are in abundance here on Cape Cod. In the spring time it is very hard to get a photograph of them as they never stop flitting from plant to plant. This time of year, they may land on a plant and stay for a bit allowing for much better photographs. They are such a pretty white butterfly with black spots on their forewings. The male has 1 spot, while the female has 2 spots. They are very common in North America. 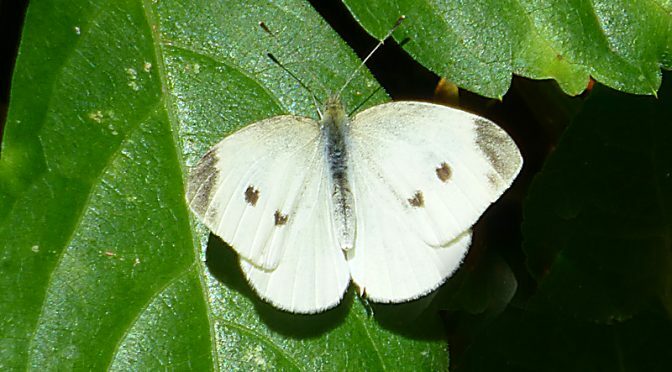 Have you ever seen a Cabbage White butterfly? 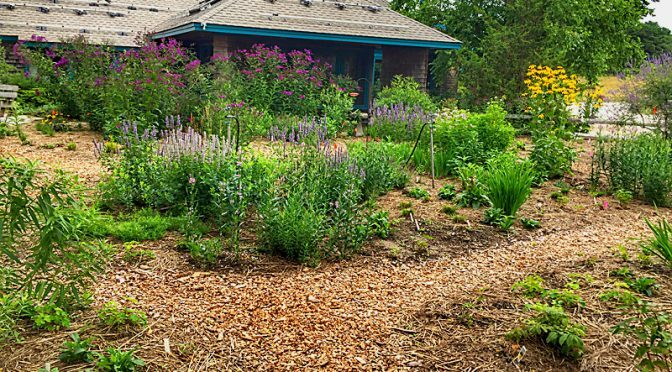 The new wildflower garden at the Wellfleet Bay Wildlife Sanctuary is just spectacular! The wildflower species are numerous and the butterflies are everywhere! There are even walking paths through the garden so you can get “up close and personal” with the flowers and get that perfect photo-op of a Monarch butterfly. If you haven’t been to the Wellfleet Bay Wildlife Sanctuary lately, it’s well worth the stop. Not only are the wildflowers and butterflies gorgeous, the shore birds are abundant out on the beach at low tide.